We’ve had the same pillows on this couch for quite a while now, and while I really liked them, I thought it was time to switch them out. I had made the hexagon pillow covers during my hexagon-making phase, and they work nicely with the blue on our walls, so I decided to pull out those fabrics again for some corresponding patchwork covers. I love how the pillows look together, and it’s definitely nice to have a little change! And who knows, perhaps if I look at these pillows enough, I’ll be motivated to finally finish up that manly quilt! 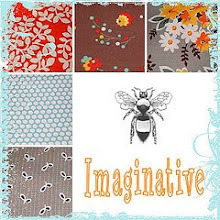 This entry was posted in Household Goods and tagged flea market fancy, handmade, hope valley, manly quilt, patchwork, pillow covers, Pillows, quilted pillows, quilting. Bookmark the permalink. Cute! Also love love love that quilt on the couch. Which one is it? nice color combo. I love your white couch too! They look great! I love the robin’s egg blue with grays. It never occurred to me to try binding pillows instead of using piping or cording (which always turn out disastrous for me). Was adding the binding your very last step after the pillow was sewn together envelope-style? Did you apply it just as you would on a quilt? I’m itching to try this now! I quilted the front and then made the backing (backing was in two pieces for the envelope closure). Then pinned the front and back together (wrong sides together) and attached the binding just as you would for a quilt. i love those colors! the pillows look great! Absolutely love all the cushions, my favourite colours, and that quilt really does need finishing before that baby comes (otherwise you will never get round to anything for the next 3 years!!). I love the color that your living room is painted. Do you happen to know what the brand and color is? The pillows and quilts coordinate perfectly! The color on the walls is Glidden Overcast. Typically I tire of wall colors quickly, but I think this is one we’ll keep for quite some time! It’s beautiful and soothing. I know what you mean about tiring of colors on my walls. I’m looking for something for either our bedroom or my daughter’s bedroom that I won’t feel like changing soon and something like this might be perfect! Gorgeous, Ashley! Bright and cheerful yet sophisticated. Love them. Beautiful work. I love the colors you’ve used. I too am cracking up at the thought of a white couch with a little one running around! 🙂 The pillows are gorgeous. those are FABULOUS, I LOVE, Love, love them. GReat color combination. I love those colors on the white couch … bright but wintery. Looking at these pillows and your potholders in the post above … I’m thinking I may need to start working to Christmas-i-fy my couch pillows. I smell a project coming on!! Thanks for the inspiration! Also thinking about little one and the white couch … you may want to start thinking about working on some slipcovers! I can only imagine the cute things you’ll come up with in that department … an how much fun will looking at all that fabric be?! Your pillows are beautiful and sure look great in your living room! I also love the colors you picked. 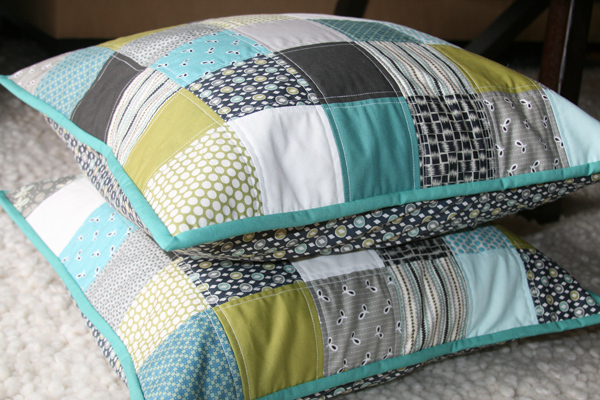 I love those patchwork pillows…such a simple design, but oh so cute! So pretty!! I’m just laughing at your WHITE couch……enjoy that now, hehehe! They look awesome Ashley. We have couch collection except mine is the one with two large back pillows instead of three. We definatly share the same taste in fabric and decor!! 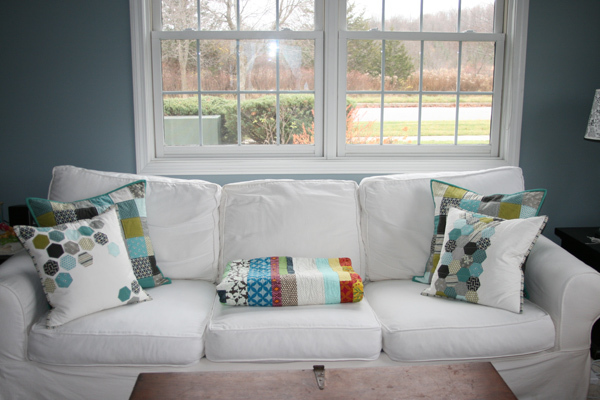 I have cushion covers on my To-Sew list and now I want to make them quilty like yours too! 😀 LOVE THEM! Love those pillows! You did a great job. I have been thinking about making new pillows for our living too. There is nothing wrong with the ones we have now I just have been thing of some kind of patch work will be awesome. I have never made a pillow envelope style but am going to try this time, was it hard? I just love all of your pillows!!! As always – nicely done and great presentation. So you used an envelope backing for the pillows. So does that mean you use pillow forms, and which ones cause yours look so inviting and comfy! Do tell. I buy my pillow forms from Pottery Barn. I like them because they’re down/feather pillows and come in a couple different sizes. One more thing… do you do all you own machine top quilting? That is an area I have not dared to tackle but would love to try, maybe start with some straight lines? Yes, I do all my own quilting. A pillow, or some other small project like that, would be a great way to get some practice. A walking foot is helpful when you’re quilting straight lines. These are so gorgeous. I second that a tutorial is needed for the those of us (ME) that have no idea how to make an envelope pillow case – or any pillow case for that matter. I love the colours and they go so beautifully with the room. I think you have inspired me to make some for my lounge too. Very cute pillows and they look great on your couch. Your WHITE couch! Have you started to wonder how the white is going to go over with a baby in the family? Maybe a little recovering is in order! 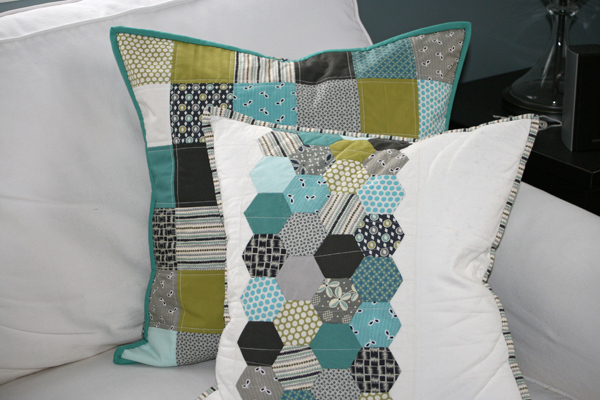 Lovely pillows – I’m loving the hexagons! Love – I worked the polls yesterday and was able to work on my hexagons between signing voters in – they’re like potato chips – can’t stop at one! Aww! I love all your ideas!! The pillows are very graphic and sharp. Great colours. I, too, wondered about your wall colour. Thanks for the information. It would be nice to have a spot on your site just for general questions. 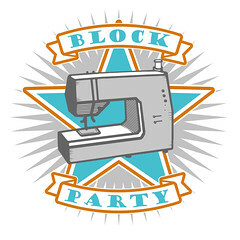 There is a lot we would like to ask you such as, “How much do you sew every day?”. I adore those colors! great pillows! Love these pillows! They coordinate so well in this room, with the white couch and blue walls. I love the look of binding on pillows. these look great! i really love how simple sometimes is just spectacular. Hello! I have been following your blog for quite awhile now and never left a comment. However, your blog continues to be a favorite of mine. I do like the pics and inspiration you give. I am starting a blog and wanted to let you know I listed your blog as a favorite. Thanks. Those colours are the colours of our bedroom and I wish I’d made these instead of buying ready made ones at $45 – $60 a pop etc. Beautiful! Wow, these look amazing! Thanks so much for sharing the photos. I’m trying to think of ideas for Christmas gifts and these might do the trick! I’m wondering if you can tell me how to make the piping form a nice corner like that? I just got my sewing machine last year and there is so much to learn! Can you tell me what color the blue piping is? It’s beautiful. Thanks. 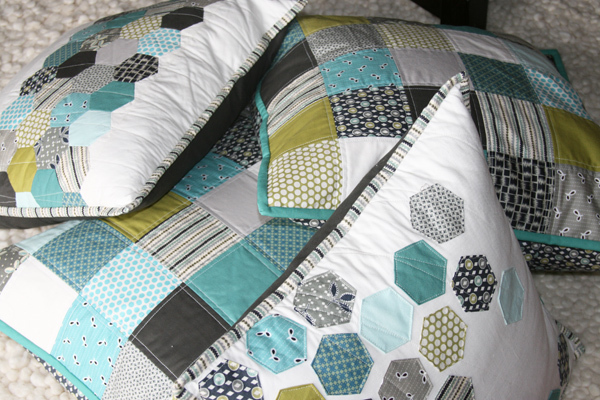 Love these cushion covers, the blue binding really finishes the quilted ones off and the hexagons ones are just my style! Can you give me the dimensions of your pillow and the size of the squares that you sewed together for these cute pillows? I could figure it out, but math is my least favourite part about sewing…so if you could lend a hand, I would love it!